After several emails back and forth, SPN Survivors was excited to meet Attitudes In Reverse (AIR) at the Supernatural convention in Washington DC this summer. We both had tables in the vendors room promoting suicide prevention, mental health awareness, and our efforts to make a difference and save lives. Sadly, we’ve both lost a loved one to suicide. We’ve also taken our loss, our pain, and channeled it into “Helping People, Saving Lives, The Family Business”, the SPN Survivors motto. On Saturday, Nov 14, 2015, SPN Survivors had the privilege of attending the special presentation of AIR’s West Coast Chapter in Pasadena, California. 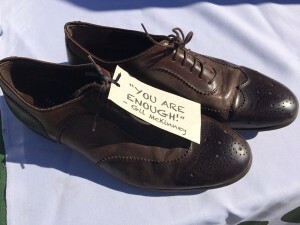 It was an evening of education, reflection, and hope as we experienced the IN THEIR SHOES traveling exhibit (featuring shoes donated by Supernatural’s Gil McKinney, Jared Padalecki, Travis Aaron Wade, and Rob Benedict), enjoyed live music by the Architects of Jazz, remembered our loved ones with a Memorial Candle Lighting Ceremony, and listened to guest speakers Nina Gutin (Clinical Psychologist from Didi Hirsch Mental Health Services), Tricia Baker (AIR Co-Founder), Jane Hightower (AIR West Coast Chapter Coordinator), Shauna Moses (Associate Director of New Jersey Mental Health & Addiction Agencies and AIR Board Member) and Jared Padalecki (creator of the Always Keep Fighting movement). Words cannot express how touched I was that Jared came and spoke at this special event! Conversations about Good Mental Health! Did you know that 50% of all mental illness develops by the age of 14, when a young person is starting high school?And that 75% of all mental illness develops by the age of 24? Mental illness does not discriminate and affects every school and every neighborhood across the country. In fact, 1 in 5 young people suffer from a mental illness during the time they are preparing for college, moving away from home, joining the military, or attending college, and it often goes undiagnosed for years. The good news is that mental illness is a health disorder that IS treatable. Education and awareness are essential in early detection, seeking help and realizing “You are NOT alone!” This is why organizations like Attitudes In Reverse are SO important. They go into our middle schools, high schools, colleges and universities (talking to students from age 10 to 24) to start conversations and create community awareness about the importance of good mental health. The goal is to put an end to the stigma attached to mental illness and advocate for treatment and recovery. In an effort to “Start The Conversation, Reverse An Attitude, Save A Life!” (AIR’s motto), SPN Survivors recently asked Tricia Baker, Co-Founder of Attitudes In Reverse (AIR), to share with us her story, her passion, and her family’s dedication to Always Keep Fighting. SPN Survivors: Tell us the story behind Attitudes In Reverse. How did it get started? Tricia: The words Attitudes In Reverse (AIR) was coined by my daughter Katelyn, after the loss of her brother, and the discrimination she had to battle due to her brother’s illness and death. Her brother, Kenny, lived for over 3 years with a mental health disorder. Katelyn watched Kenny being judged and criticized by people who had no understanding of his illness. Before his first break, Kenny was an honor student, a star swimmer, a life guard, a friend to many, a kind brother, and a loving son. He had the world at his feet, until the age of 15 when his illness hit. It was difficult to find him help. He was at the highest level of state care but we could not get help. Many at the school thought he was not really sick, after all mental health disorders are invisible illnesses. People at the school, both students and educators called him lazy and judged and criticized him without understanding what depression and other mental health disorders are and the impact they have on the human body. We believe, if only people were kinder to him, were more compassionate, more understanding and educated, there would have been a good chance he would still be alive today. AIR was born out of the most horrific loss, the loss of a son. The loss of a brother. We vowed as a family that no child should have to struggle with an illness, and battle the stigma of that illness. We have vowed to educate youth so that no one is ever embarrassed or afraid to seek treatment. Attitudes In Reverse educates youth so they know there is hope for healing. Jared Padalecki’s Always Keep Fighting movement embodies what the Baker family has lived for the past 10 years. First, it was fighting to keep a child alive. Then it was fighting to keep a second child healthy and in school. We didn’t know that the high school was going to let Katelyn graduate until 12 hours prior to graduation. Finally, Attitudes In Reverse fights daily to get into schools, battling stigma, to save young lives. SPN Survivors: Your website states, “The mission of AIR Attitudes In Reverse is to educate society about mental health.” Tell us about AIR’s programs and projects and how you are accomplishing this goal. The AIR student presentation is mental health education geared towards middle school, high school and college aged students. It is a peer-led multimodal presentation: powerpoint, video, interactive discussion. It can be 45 to 60 minutes, depending upon class length, and can be offered during Physical Education, Health, Science, Studies/Humanities classes. What is a mental illness? What is not? Possible effects of improperly-treated mental illness. One or two short stories of families affected by mental illness and/or suicide. Warning signs of suicide and statistics. In just under 5 years, Attitudes In Reverse® has educated over 22,000 students, in three states, NJ, NY and VT. AIR™’s Coming Up for AIR program educates students so that they know there is no shame in asking for help, and that there is hope for healing. Our latex wristbands colors are Green, signifying Children’s Mental Health, and WHITE, representing HOPE that one day stigma will be gone. On the outside of the wristband are the words: AIR AttitudesInReverse.org. Anyone who wears the wristbands, gives a visual cue to ALL that they are approachable, and will not judge or criticize. They will listen and assist in however they can. At DC Con in July, we gave away over 500 wristbands and now we give away approximately 1,000 wristbands at every Supernatural convention we attend. We are also starting many conversations about good mental health. Our annual high school and college age student t-shirt design contest is going on NOW. First prize is an iPad. Winning design is produced. All AIR™ volunteers get a FREE AIR Shirt in appreciation of their work and efforts of starting the many conversations that the best suicide prevention plan is a good mental health awareness program. In 2014, our second place winner was a young person who entered the contest while in a residential treatment facility. She came to our event to receive her prize, and saw over 600 people wearing her design on their t-shirts. She was overwhelmed to tears, as she had never won anything before in her life. AIR’s T-shirts have not only traveled across the US but have traveled across the globe to Australia, England, and Saudi Arabia. To let those who are struggling in silence know that they are not alone. To educate the 75% of the population that has no idea how difficult it is to live with a mental health issue. With education comes understanding, empathy and kindness. Instruction for parents, teachers or any adult who works with children, to help identify early warning signs of mental health disorders in our youth. This national program, developed in Australia, is endorsed by President and Michelle Obama. Two annual scholarships are given to a graduating seniors. One at our local high school, for their bravery in making societal change. The second is given to a Senior swimmer on Kenny’s former swim team to the swimmer who has overcome significant challenges. AIR is a small army of passionate people, who truly believe that we can make a difference in the world. We are ALL volunteers, and all Attitudes In Reverse work is done in our “spare time”. SPN Survivors: Over the past couple of months we have been helping someone who is struggling with depression, anxiety and other “invisible illnesses” find a service dog, so I am especially interested in your Paws for Minds Program. Please tell us more about how this program is changing people’s lives for the better. In 2012, AIR™ began its program providing emotional support dogs and psychiatric service dogs to people in need; AIR Dogs: Paws for Minds. Our hope is to locate really great dogs in shelters and match them up with a human partner who suffers from some mental health issue. To date we have placed 10 Emotional Support Dogs and 1 working service dog. AIR Dogs pays for any shipping costs of the animal, provides financial support to the foster family, pays for veterinarian and grooming expenses and assists the owner financially with training. AIR Dogs will pay for 1 year of training to have the dog certified as an emotional support dog. We placed a working service dog to a young woman for no cost. Our hope is to also be able to provide foster care to AIR Dog owners, should they require long term residential treatment. One little dog spent 8 months with a foster mom, while his real mom was getting well. Knowing that this little dog was waiting for her when she got home, inspired her to work harder at getting well. I have attached a video of our AIR Dog, Sherlock, graduating as a service dog at our annual Miki & Friends 5K Walk/Run for AIR. SPN Survivors: Are there any special events or fundraisers coming up you’d like to tell us about to help spread the word about Attitudes In Reverse? AIR launched their West Coast Chapter in Pasadena, CA in November 2015 and we are very thankful to all those who attended. Annually California loses 452 young people, ages 10-24, and 354 of these are young men. The need is great to Start The Conversation, Reverse An Attitude, Save A Life! I am currently discussing new chapters in Minneapolis, Western PA, and Phoenix, AZ thanks to the SPN Family and the Always Keep Fighting campaign. You can email Info@AttitudesInReverse.org if you would like to help. A Day Celebrating How Dogs are Good For Our Mental Health is always celebrated the third Saturday in May. The purpose is to reach the 75% of the population who have no idea how difficult it can be to live with a mental health issue. Education will lead to understanding, kindness and empathy. We reach this part of society through their dogs. This event is an awareness event, and a fund-raising event. 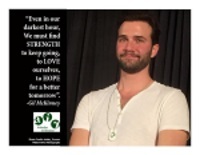 In May 2015, Gil McKinney (Supernatural‘s Henry Winchester) attended and performed “You’ve Got A Friend” for our attendees. Gil has been a big supporter of Attitudes In Reverse, especially the AIR Dog program, and has two adorable rescue dogs. This event is in Mercer County, NJ, but SPN Family traveled from Louisiana and Boston to help volunteer. People can also participate in this event virtually. In late November/early December we will be hosting Warm AIR for Winter. It has become our new holiday tradition to collect socks, and other warm items, and deliver them to patients in mental health facilities so no one feels alone through the holidays. Sadly, 70% of people in psychiatric hospitals never get a visitor. For Christmas of 2014, we collected over 600 pairs of socks in only three weeks. My husband, Kurt, and I took therapy dogs and on Christmas Eve, we visited the people at the Eating Disorder Unit at a hospital, delivering socks. On Christmas Day, we delivered over 500 pairs to patients at the local mental health hospital. We also collected sweatshirts, hats and gloves, and some of the people in these facilities are homeless. Our therapy dogs Miki and Luna brought smiles to so many on Christmas Day. Moving forward, we are not only looking for donations (especially men’s socks) but encouraging others to search out their local psychiatric hospital to run their own collection. I would LOVE if we could make this a national program reaching as many people in hospitals as possible. If you would like to donate or help Attitudes In Reverse in any way, please visit their website for more information. Be a Hero! Take the Hero Challenge!